‘Escape Room,’ ‘Marcella,’ ‘Good Place,’ More on Home Entertainment … Plus Giveaways!!! An innocent night of fun turns into a cruel game for survival when “Escape Room” arrives on DVD, Digital HD and On Demand Tuesday Oct. 17 from Lionsgate. The claustrophobic thriller filled to the brim with inventive terror stars Evan Williams (“Awkward,” “Degrassi: The Next Generation”), Annabelle Stephenson (“Revenge”) and Billy Flynn (“Days of Our Lives”). For Tyler’s 30th birthday, his girlfriend Christen gets him an unusual gift: admission to a mysterious escape room event. As they enter with four friends, they find themselves trapped in bizarre rooms where they must solve tricky puzzles in order to advance. But Christen has disappeared, and Tyler is shocked to see her on a video monitor, naked and trapped in a cage while the seconds count down. When the cruel game begins to turn deadly, he realizes they may not all escape with their lives. 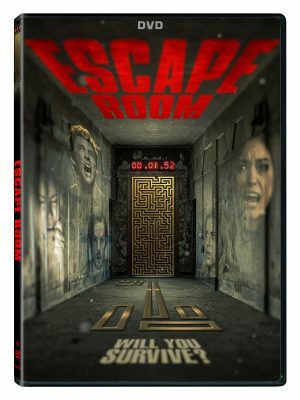 The Escape Room DVD will include a director’s commentary, deleted scenes and bloopers. Just in time for Halloween, the DVD will be available for the suggested retail price (SRP) of $19.98. Written and directed by John Hughes, the classic buddy comedy “Planes, Trains and Automobiles” has arrived for its 30th anniversary on Blu-ray Combo Pack with a Digital HD copy and on DVD, from Paramount Home Media Distribution. Starring comedy geniuses Steve Martin and John Candy, the hilarious classic follows a businessman (Martin) who is struggling to get home for Thanksgiving, but burdened by one travel mishap after another, as well as the company of an annoying traveling salesman (Candy). Filled with funny situations and a generous helping of warmth, the film also features appearances by Michael McKean, Edie McClurg and Kevin Bacon. 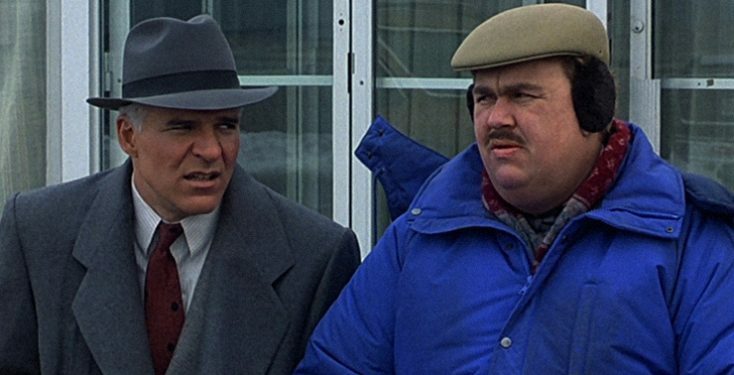 The “Planes, Trains and Automobiles” Blu-ray features an in-depth retrospective on John Hughes’ career that includes interviews with those who worked with him and explores his indelible impact as a writer and filmmaker. Additional features include “Getting There is Half the Fun: The Story of Planes, Trains and Automobiles,” “John Hughes For Adults,” a tribute to John Candy and a deleted scene. A more contemporary comedy, “Girls Trip,” arrives on Blu-ray, DVD and On Demand Tuesday Oct. 17, from Universal Pictures Home Entertainment. It also is available now on Digital formats. The comedy follows four best friends on an adventure of a lifetime as they reunite for a weekend of fun, festivities and outrageous adventures only to learn they are not as strong apart as they are together. With over an hour of exclusive unrated bonus content, “Girls Trip” home entertainment versions feature even more of the group’s outrageous shenanigans with deleted and extended scenes, gag reel and more. When the lifelong friends, known as the Flossy Posse, get together nothing can stop them but themselves. Reunited from across the country, they travel to New Orleans for the annual Essence Festival, sisterhoods are rekindled, wild sides are rediscovered, and there’s enough dancing, drinking, brawling and romancing to make the Big Easy blush. Director Malcolm D. Lee (“Best Man Holiday”, “Barbershop: The Next Cut”) helms the production, with an all-star cast that includes Regina Hall (“Best Man Holiday”), Tiffany Haddish (“The Carmichael Show”), Jada Pinkett Smith (“Bad Moms”) and Academy Award nominee Queen Latifah (“Chicago”). “Girls Trip” is produced by Will Packer (“Ride Along” franchise) and with a screenplay by Kenya Barris (“Blackish”) and Tracy Oliver (“Barbershop: The Next Cut”). Extras include deleted scenes, a gag reel, and featurettes that go behind-the-scenes with the cast and crew, delve into outrageous moments on set, discovering the soul of New Orleans and more. A maverick commander and a young general join forces to battle pirates who pillage small villages in 16th-century China in the epic historical action drama “God of War,” debuting on digital, Blu-ray Combo Pack and DVD Tuesday Oct. 17 from Well Go USA Entertainment. During the 16th century, pirates rule the Chinese coastline, pillaging the small villages and terrorizing the citizens. When maverick leader Commander Yu (martial arts legend Sammo Hung, “Ip Man 2”) enlists the help of a sharp young general (Vincent Zhao, (“The White Haired Witch of Lunar Kingdom”), they devise a plan to defeat the pirates. A violent clash of wit and weapons will decide who will rule the land in this sweeping historical epic from veteran action director Gordon Chan. The haunting new British detective drama “Marcella: Season 1,” makes its DVD debut Tuesday Oct. 17 from Acorn, an RLJ Entertainment brand. Marcella Backland (Anna Friel,” Pushing Daises”) left the Metropolitan Police for the sake of her family, only to have her husband leave her. She returns to her job on the murder squad, investigating a case that seems disturbingly familiar. As Marcella dives deeper into the case, the devastating changes to her personal life leave her in a fragile state. Struggling to cope, she experiences blackouts and extreme rage. When someone close to her estranged husband (Nicholas Pinnock, “Fortitude”) is murdered, Marcella fears she may have been involved. From internationally renowned screenwriter Hans Rosenfeldt (“The Bridge”), “Marcella” boasts an ensemble cast that includes Laura Carmichael (“Downton Abbey”), Jamie Bamber (“Battlestar Galactica”), Maeve Dermody (“And Then There Were None”), Nina Sosanya (“Love Actually”), Sinead Cusack (“Eastern Promises and Harry Lloyd (“Game of Thrones”). The DVD set includes all eight episodes of the first series (season) on two-discs. The SRP is $49.99. From Michael Schur, executive producer of “Brooklyn Nine-Nine” and “Parks and Recreation,” comes the hilarious first season of NBC’s “The Good Place,” an original new comedy starring Kristen Bell (“Bad Moms”) and Ted Danson (“Cheers”). The complete first season is available on DVD Tuesday Oct. 17, from Shout! Factory. What happens when we die? It’s a question people have wondered, since the beginning of time. But when Eleanor Shellstrop (Bell) dies tragically, she finds out that the afterlife is amazing; full of frozen yogurt, soulmates and wonderful people who have done incredible things with their lives. It is absolutely perfect. The only problem is Eleanor isn’t supposed to be in The Good Place. In fact, her life decisions wouldn’t have even gotten her close. But due to a clerical error, she’s been given someone else’s reward and now has to struggle with being good in order to make sure her secret isn’t discovered. The DVD includes audio commentaries with the show creator Schur, Executive Producer Drew Goddard and co-stars Jameela Jamil (who plays Tahani) and D’Arcy Carden (who plays Janet) as well as a gag reel and more. With the holiday season right around the corner, it’s time to start making a dent in your gift-giving list. Luckily, Front Row Features has an assortment of giveaways this week that will make the perfect stocking stuffer. We’re giving away five copies of the breakout comedy of the summer, “Girls Trip,” on Blu-ray/DVD Combo Pack as well as three copies of the first season of NBC’s new hit sitcom “The Good Place” on DVD and five copies of the historical action drama “God of War” on Blu-ray/DVD Combo Pack. For your chance to win one of the above titles, simply email socalmovieeditor@aol.com by Monday Oct. 23 with which home video release you hope to win in the subject line. Good luck! Next PostPhotos: ‘Escape Room,’ ‘Marcella,’ ‘Good Place,’ More on Home Entertainment … Plus Giveaways!! !